John Rattray is vice president of sales and marketing at Memex Automation, Burlington, Ontario, Canada: 905/635-1540; www.memex.ca. Magellan’s continuous-improvement coordinator Jonathan Ung checks data gathered by the Merlin machine-to-machine communications platform. With more than 60 yr. of producing components for some of the most sophisticated supersonic jet-fighter aircraft in the world, longevity for the Magellan Aerospace plant in Kitchener, Ontario, Canada, is partly due to its expertise in high-velocity hard-metal machining of titanium, Inconel and stainless steel. The firm manufactures major components for the futuristic F-35 Lightning II fighter, as well as landing gear and other key components for most major aerospace-OEM platforms. The 135-employee, 100,000-sq.-ft. plant boasts of relentless pursuit of excellence, which recently led it to invest in new “shop floor to top floor” software supplied by Memex Automation, Burlington, Ontario, Canada. Its Merlin (Manufacturing Execution Real-time Lean Information Network) software is a manufacturing execution system and machine-to-machine communications platform that provides real-time visible dashboard metrics. Merlin executes work orders generated by an ERP system and sends the results back to the central ERP database. Other functions include production data collection, downtime and reject-cause analysis, labor-productivity tracking, usage-based preventive maintenance and visual production scheduling. Users, such as Magellan, leverage information captured by Merlin to increase production and income from operations, while raising overall equipment effectiveness (OEE). Dave Quehl, Magellan Aerospace’s manager of technical services, oversaw installation of the Merlin software in 2011, and has it running on various machines throughout the plant. Continuous-improvement coordinator Jonathan Ung is charged with tracking the plant’s progress with Merlin; he has gathered very promising return-on-investment results. 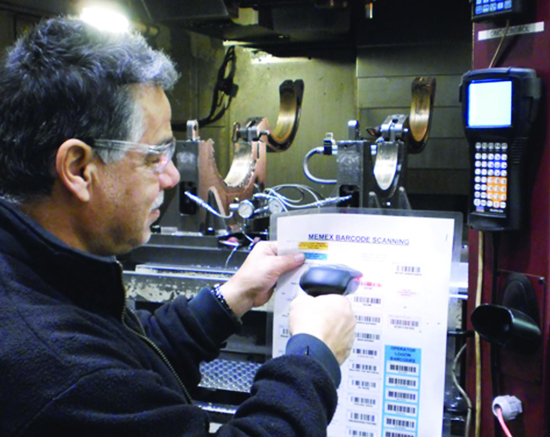 Quality-control inspection of finished products at Magellan is complemented by Merlin’s ability to track more than 100 key-performance indicators on machine tools, including product rejects. On one of its machines, says Ung, the shop was able to more than double machining time, for a 100-percent-plus efficiency gain. “It was so much of a gain that it was surreal at first,” says Ung, “with experienced operators very surprised to see the results. “Previous to Merlin,” continues Ung, “shopfloor supervisors would manually record information regarding start and end times, and quantity produced during the shift. However, the information didn’t provide the detail that enables better decision-making. With Merlin in place, we’ve seen a dramatic drop in time spent gathering data, along with a notable increase in the amount of data available to management and to operators. After collecting a month’s worth of information from Merlin, Ung and his team initiated a lean plan-do-check-act (PDCA) methodology with corrective actions. After completing the corrective actions, Ung was able to show that Merlin brought the plant’s OEE to a sustained 85-percent-plus, up from 36 percent. Day-to-day, Merlin provides Ung and his team with instantaneous as well as timed e-mail alerts to minimize downtime. Dashboards, displayed on video screens throughout the shop floor, communicate realtime machine status.